Located at the heart of the historic College Avenue Campus, The Yard is a residential, retail and outdoor space and is one of the most unique college-community spaces in America. Situated near a busy campus bus stop, the development is not only in a prime position for students but incorporates a larger community of local residents and folks coming to the neighborhood for work or to watch the nearby baseball game. 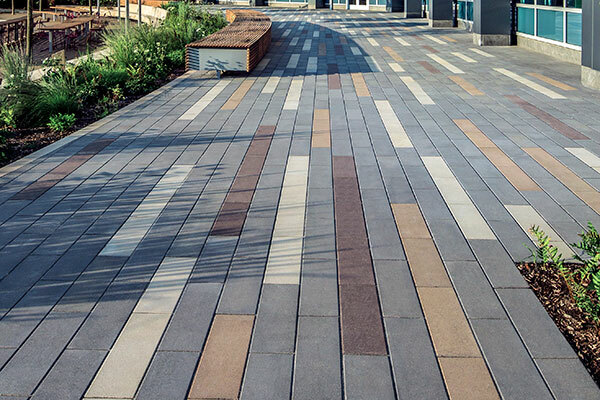 The plaza includes lively walkways patterned with Promenade Plank Paver in several grey shades around a 25,000 square foot central green space with a large outdoor TV screen. The many programmable events include yoga in the morning, sporting events, to movies and music in the evening, with lots of tables and chairs for all who want to hang out. The Yard is not just a meeting place for the College Avenue Campus but a connection point within the entire academic community. Serving as a new “front porch” to the Rutgers campus, The Yard is the newest gathering space for students, faculty and members of the greater New Brunswick community.